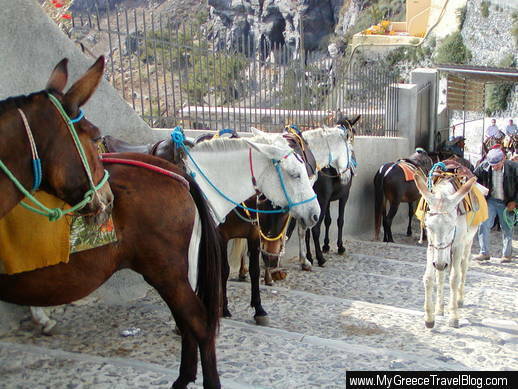 Animal abuse: An international online petition is urging local authorities on Santorini to make significant improvements to the welfare and working conditions of dozens of mules and donkeys that are forced to repeatedly carry tourists up and down hundreds of steps on the island every day, often without adequate water, shade and rest. 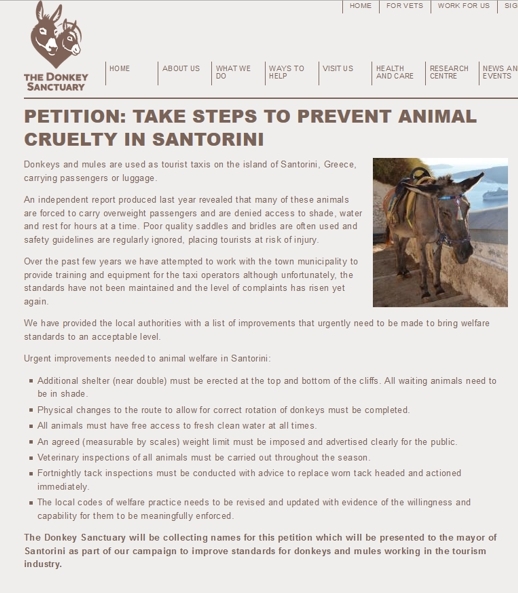 The petition is the latest in a series of efforts The Donkey Sanctuary has undertaken during the past 8 years as part of an ongoing campaign to reduce and prevent abuse and cruelty toward donkeys and mules on Santorini, one of the most popular tourist destinations in Greece. “Over the past few years we have attempted to work with the town municipality to provide training and equipment for the taxi operators although unfortunately, the standards have not been maintained and the level of complaints has risen yet again,” The Sanctuary explains on its website. The petition calls for a number of “urgent improvements” to the welfare of Santorini’s mule taxis, including provision of adequate shelter and shade, access to fresh water, predetermined weight limits for passengers, and regular veterinary and tack inspections, among others. Names collected on the petition “will be presented to the mayor of Santorini as part of our campaign to improve standards for donkeys and mules working in the tourism industry,” The Sanctuary says. We must do all we can to stop this shameful cruelty which has no place in the 21st century! DISGUSTED that in this day and age you are using animals to make money from. It is backward and has no place in today’s society. I for one will NEVER visit Santorini or encourage others to do so, in fact I will tell them not to, due to your disgraceful treatment of these innocent creatures. agreed. I will never visit Santorini again (unless they stop this barbaric behaviour) and will encourage others not to go there either. I am so glad someone is doing something for the poor animals next year me and my husband are visiting Santorini and we are excited BUT seeing all the poor donkeys and mules has put a demper on our excitement and i for sure can not hold my tongue if i see any animal abuse…. How is the problem lately is it any better ?? This is 21/8/17 and I have just returned from holiday in Santorini and I am totally disgusted that there is still no improvement in the condition of which these poor animals have to work in ,I did not see any food or water given to these poor beasts who work almost twelve hours a day carrying extremely over weight people who can’t be bothered finding other alternative methods of transport , why to this day is this cruel barbaric trade is allowed to go on day after day , why is nobody taking a stance and stop it . My cruise company NCL certainly did not advise any of there passengers not to ride the donkeys ( so no help the then ).